Note: This information page is a work in progress. It should by no means be considered COMPLETE. The archives of info that currently lives on my computer is being moved over to this page so that is more universally accessible. I also add new information as I get asked questions on topics not currently part of my archive. So browse now and come back later. I hope you find this resource useful in your gardening life. Goodnight Design Resources — My most current preferred local resources. Get-Started Guide — Tips on getting from design plan to installation. Call Before You Dig — Resource for OR, WA, MT. Use website, or just dial 811. Why We Use Botanical Names — Learn why it’s best to call plants by their botanical names. Learn Botanical Names — Learn the meaning of common Latin terms that describe plants. Gardener’s Supply — Products that might help you get going. Decent quality. Decent prices. Sun Position Calculator — Interactive tool to help understand how much exposure your lot gets. Sun Position Calculator — TUTORIAL for above tool. Hardiness Zone Maps — Plant, gardening & botany related maps — even current drought status. Heat Zone Maps — AHS info to learn about plant heat tolerance and find your zone. Many plant species have variation in form, size, coloration, etc. When humans have a hand on producing these variations, they are called CULTIVARS (CULTIvated VARiety). Note: Be aware that not all plants on all lists are always available everywhere. Growers can sell out. It takes time to grow more. It is difficult to always predict consumer whim. Also, sometimes plants fail to meet the expectations. If so, it may be allowed to go the way of the Dodo bird. Growers’ websites are the best place to find out what is available. Then acquiring what you find online can be tricky. Acer palmatum — Japanese Maples — Maplestone Ornamentals; includes a few other species that are similar to Japanese maples. Hosta — More targeted search with menu according to color and other characteristics. Also some nice companions for hostas like epimedium, helleborous & ferns. Japanese Maple — Acer Palmatum — Maplestone Ornamentals; includes a few other species that are similar to Japanese maples. You may have noticed I have rely heavily on Terra Nova Nurseries for cultivar lists and information. The main reason is they have comprehensive information, and they are LOCAL. This means the information they list is correct for our region and growing conditions. I just wish they grew everything else. If I possibly could, I have found cultivar lists from local sources. But it was not always possible, and though the general information on these non-local sources is valid, remember that in the PNW, plants can grow up to 30% larger than the same plant would grow in another region of the country that also has USDA Hardiness Zone 8. See this post for an explanation of why this is so. Culture is what plants need to thrive. Maintenance is what humans do to ensure plants proper culture needs are met. Lawn — See separate category on this page. Pruning — See separate category on this page. Trees & Shrubs — See separate category on this page. Aspen — Why this is not a good tree for suburban and urban areas. Azaleas — Resisting lace bug infestation. Bacterial blight — Most common in lilac, and ornamental cherry and apple species. Crimson Clover as Cover Crop — my handout with links to resources. Hazelnut — OSU Extension resource with lots of publications referenced. Heucherella — Information from Terra Nova. Red-twig Dogwood — My article about shrub dogwood in landscape settings. Walkway – Dry Set — VIDEO — some vendors from my resources list! IPM – UC Davis Online — One of the very best IPM resources. My personal preference. Invasive Plant Management — Though it’s a New England publication, most of the information is transferable to our region. Beyond Pesticides — Non-toxic pest management strategies and products. Hortsense — WSU Extension — Managing common landscape and garden plant problems. Pestsense — WSU Extension — Managing common INDOOR pest problems. Sooty Mold — Ohio State Univ fact sheet. Attracting Beneficial Insects to the Ornamental Garden — My article and PLANT LIST! Beneficial Insects, Spiders, and Other Mini-Creatures in Your Garden — by David James; how to get the good guys to stay. Natural Enemies of Crop and Garden Pests — Handy pocket guide to print out. Lace Bugs Arrive in the PNW — My article from when I first noticed these new pests. Lace Bug — Controlling lace bugs. Vinegar in the Garden — My article about uses for vinegar other than as herbicide. Horticultural Oil — My article. Insecticidal Soap — My article. Insecticidal Soap: Make Your Own — My article. Safari Insecticide Label — Info about this insecticide. Gravel on Lawn — YES! This is for real, and really works. Lawn Renovation — Complete renovation procedure. More About Lawn — More observations about lawn and tolerance. Moss as Lawn — Why there is moss in your lawn. BBC Gardening — Hasn’t been updated in a long time, but still a good resource. Missouri Botanical Garden — This isn’t local to us, but it’s information is detailed and very good. Other great info at their site. One of my most used resources! UtiliTrees — Good list of appropriate street trees. LocalHarvest — Find a CSA near you! Cultivar Lists — See separate category on this page. Butterfly Larvae Need Special Plants — Savvy Gardening website. Be aware more butterflies listed are East Coast US or Canada species, but the article well explains why we need plants for the young as well as the beautiful adult butterflies (and moths). PNW Butterfly Larvae Host Plants — My revisions of the list presented by the article at the link above. Japanese Maples — See Cultivar Lists section for both Japanese Maple and Acer palmatum. Native Plants — I created this list for the Naturally Beautiful Backyards program. Not exclusively natives, but a good listing of plants that offer good habitat for birds and critters, yet are well-behaved enough for a smaller residential situation. Oaks – Plants for below oaks are also water-wise plants suitable for our region. Sewer-Safer Plants – No tree is completely safe to plant over sewer lines, but these are safer than many. Still, none should be planted directly over a sewer line. The document is from Tennessee, but most all of those trees grow here as well. Water-wise Plants – Plants for below oaks are also water-wise plants suitable for our region. Great Plant Picks — This is a wonderful organization that specializes in plants for the Pacific Northwest. Each year they make a new selection of ‘Great Plants’ for that year. On their site you’ll find information and oodles of lists. Black Walnut Tree — What can live below them and what can’t; and why. Also see section on Toxicity further down this page. Hardwood Cuttings — WA Native Plant Society resource from WSU Extension. Propagating with Stem Cuttings — PNW Extension. Good lists for evergreen & deciduous woody plants. Basic Woody Plant Pruning Guide — This is the handout I use when I teach basic pruning. Beautyberry (Callicarpa americana) — Clemson Extension; pruning plus care. Blackberry — VIDEO — Winter pruning. Don’t know why you would want to use your valuable space for something that grows prolifically in our region (PNW). But if you do, here is what to do. Blueberry Pruning Guide — My article. This is the handout I use when I teach basic blueberry pruning. Blueberry — Good description, imagery, technique, but it’s Maine where it’s significantly colder than here, so their pruning window is wider than ours. Be sure your plants are still dormant when you prune; January or February for zone 8 PNW. Blueberry — Really excellent explanation of why to prune which types of branches. Blueberry — OSU Extension; Everything you need to know about growing blueberries. Clematis — VIDEO — Tagawa Gardens; Demonstrates both spring and summer vines. Fig — How to prune early crop figs for cool season climates (like PNW). Kiwi — Who knew that kiwi should be pruned like a shrub for maximum production? Kiwi — Lots more about kiwi. Kiwi — Build a trellis strong enough to support kiwi. Raspberry — VIDEO — Summer pruning. Raspberry — VIDEO — Winter pruning. Gardener’s Supply — Not that this is the only source for gardening equipment, but they do have decent prices and decent stuff. Seabright Gardens Hostas — Local source of hostas. Download pdf catalog here. Beneficial Insects, Spiders, and Other Mini-Creatures in Your Garden — WSU Extension information. Cass Turnbull’s Guide to Pruning — My #1 most referred resource. The best pruning guide. Garry Oak Gardener’s Handbook — Planning and care of Garry oak habitats. Free download. Gardening in Washington State — WSU Extension website and publications. Garden Wise — PNW Invasive Plant Alternatives. There are a couple pubs here. Select ones for the side of the Cascades that you live on. Organic Pest Management in Backyard Fruit & Berry Patches — Free download. Oregon State University Extension Publications — Good resources for our region. Many are free. Washington State University Extension Publications — Good resources for our region. Many are free. Go To Reading — Some books that would be good additions to your landscaping library. Crimson Clover as Cover Crop to Improve Soil — my handout with links to resources. Nutrient Cycling (or nitrogen cycle) — This is a term used to describe the process of how organic matter is cycled and recycled through an ecosystem. One of the ways nutrients are recycled is by breaking down fall leaves. Use of fall leaves is the most low-cost and low-maintenance way of supplying mulch and nutrients to your ornamental landscape. I developed a talk with handout page to explain how this process works and why it’s important to understand for all gardeners. View the handout and listen to the audio file at the links below. Nutrient Cycling Talk — Voice recording about how fall leaves can improve ornamental landscape beds. I recommend viewing the flyer at link in the next bullet item when listening to voice recording. This recording is from one of the typical talks I give to most clients when they ask me about soil, mulch, or compost. It is specific for west of the Cascades zone 8, but I do believe the chemical functions are universal. Using Leaves as Mulch — How fall leaves can improve ornamental landscape beds. Flyer companion to voice recording. Sheet Mulching — My article; do it /don’t do it; how-to. Soil: Deep Down & Dirty — VIDEO — Best soil education I’ve found; not too much ‘science’. A & L Western Ag Labs — Standard soil tests. Many other sorts of testing. 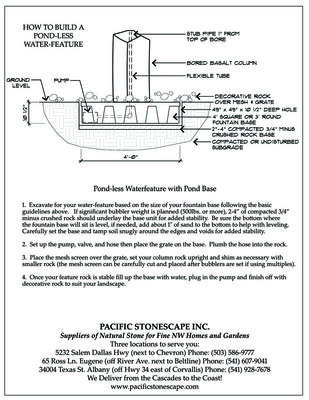 EarthFort — Standard soil tests. Microbe analysis. UMass Lab — Highly recommended by The Garden Professors. Standard test plus organic material. Some plants are toxic for humans to ingest or touch. Some of the same, or other plants are toxic to certain non-human animals. This is not my area of expertise, but as I come across information that relates to plant toxicity in the ornamental landscape (not related to farm and animal husbandry), I will try to show some resources here.